Knowing the difference between an unbound vs. a bound Microsoft Access form will help divide the distinction and allow you to determine which approach will suit best. I’ve always been a big fan of Microsoft Access VBA programming; why? Because I like the way a rich application like this can be customized and designed from the floor up with little IT programming and development knowledge. Plus, I like building things. As a recap, knowing the difference between what an unbound vs. a bound Microsoft Access form is will help divide the distinction and allow you to determine which approach will suit best. Microsoft Access, like any other development IDE, will provide an endless set of properties across the "one-stop shop" set of objects and forms are no different. 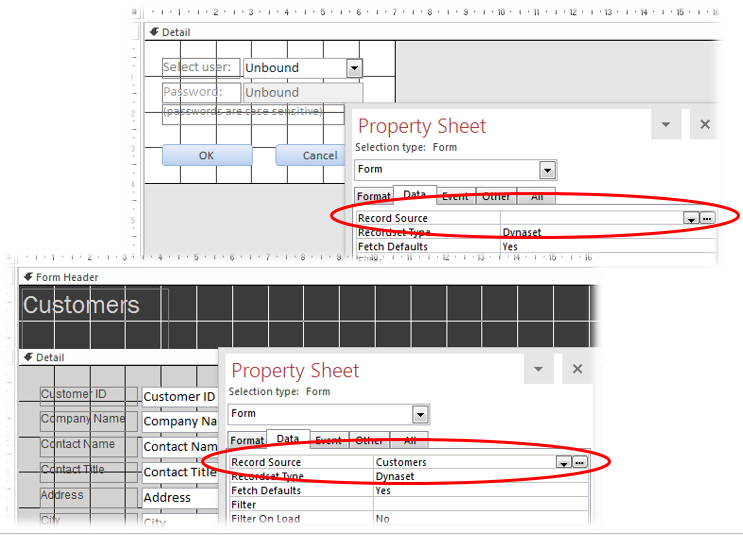 One property we are talking about of course is the "Record Source" property (from the main form design area), which is where you either set a data source (table, query, or SQL statement), binding your form, or leave it blank, making it unbound. The key point to help answer if we should use unbound forms is of a personal one and whether you, the developer, programmer, or "power-user," have the time and knowledge to add some VBA code to help support the unbound approach. That’s the answer here for me and the link to a previous article demonstrates some of the pros and cons for you to evaluate the best route. One of the main questions (if you are comfortable with either approach) is will it provide better overall performance if you choose the unbound option? The quick answer is "not necessarily," as a bound form with less than a 1,000 records and certainly wrapped via a query will be very quick indeed. It would take tens of thousands of bound records with poor indexing to start to see a difference. To gain the overall control of a form and its controls (which can also be unbound), you use the unbound approach ending up with a more professional and polished interface. The other key decision point for me if your Microsoft Access database will be shared and more than one user could end sharing the same form (and even record) at the same causing potential record locking and conflicts. If so, the unbound option is the one. It’s common sense required here to decide which way you should lean to, but one thing to also consider is how busy and rich will your form end up, and very importantly, will it contain several sub-forms? Something for another discussion, perhaps!